Trump is threatening Apple now. Tim Cook will eat him for lunch. President Trump is threatening America’s largest company as part of his economic plan, but has he bitten off more than he can chew by taking on Apple? Out CEO Tim Cook is hardly a man to cross. Well known as a shrewd negotiator who takes the long view of problems, Cook also has a lot of political strings to pull and Apple is one of the most popular in the world. If Trump’s latest shakedown of a world leader doesn’t succeed, he told the Wall Street Journal he would place more tariffs on Chinese products – including iPhones and laptops. “I can make it 10 percent and people could stand that very easily,” Trump said. This would be on top of the tariffs set to go into effect on January 1. Trump imposed 10-25% tariffs on $200 billion in imported Chinese goods earlier this year. Cook, who was on Hillary Clinton’s list of potential vice presidential picks, came out as gay in 2014 in an essay published in Bloomberg Businessweek. Known as a cunning manager, he took over following the death of Apple founder Steve Jobs. Under his leadership, the company has grown even larger and stepped up their civil rights advocacy. The company has been a leader in corporate activism on behalf of LGBTQ issues. 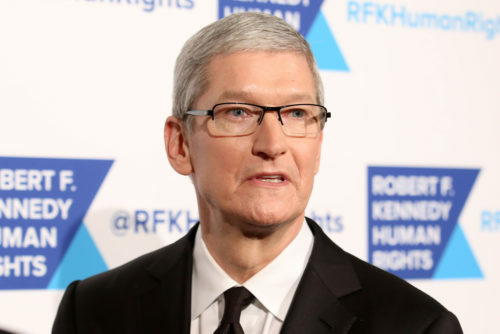 Cook also negotiated several of Apple’s lucrative deals with China and knows the economic landscape well – along with the major political players on both sides of the ocean. Before Jobs’ death, Cook was often described as the genius behind the curtain and key to the success of Apple’s operations. Cook has built Apple into one of the largest companies in the world, generating over $200 billion in revenue in 2017. Unlike Trump, he is an actual billionaire and didn’t inherit his wealth. After taking office, Trump asked Cook to sit on the advisory committee to the Office of American Innovation. Cook declined.